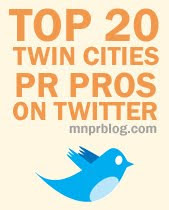 This year's Minnesota PRSA Pro-Am Day will be held on Friday, March 7. Registration is scheduled to close February 25 and we are still approximately 10 professionals short of our goal - we need your help! Pro-Am Day is an annual mentoring event that matches PR professionals from around the Twin Cities with PRSSA students in an effort to provide a day of job shadowing and networking for students interested in learning more about the PR industry. The job shadowing portion of the day takes place from approximately 9 a.m. to 2:15 p.m. with an optional speed networking event in the afternoon. Please consider participating in this year's Pro-Am Day event by hosting a student. You'll be giving an eager student an experience he or she will never forget.